My wife and I were recently invited here for a press meal. 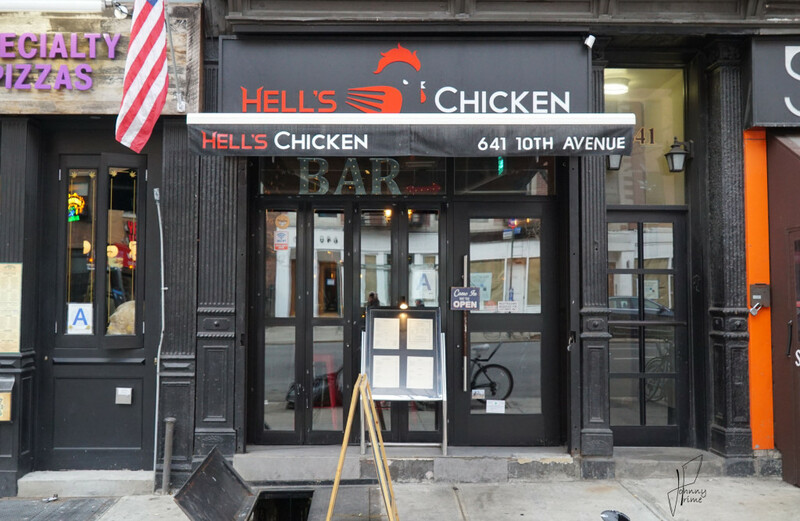 This place is located just above the new Hudson Yards construction area on the west side. It’s a prime spot for the soon-to-be-bustling area. 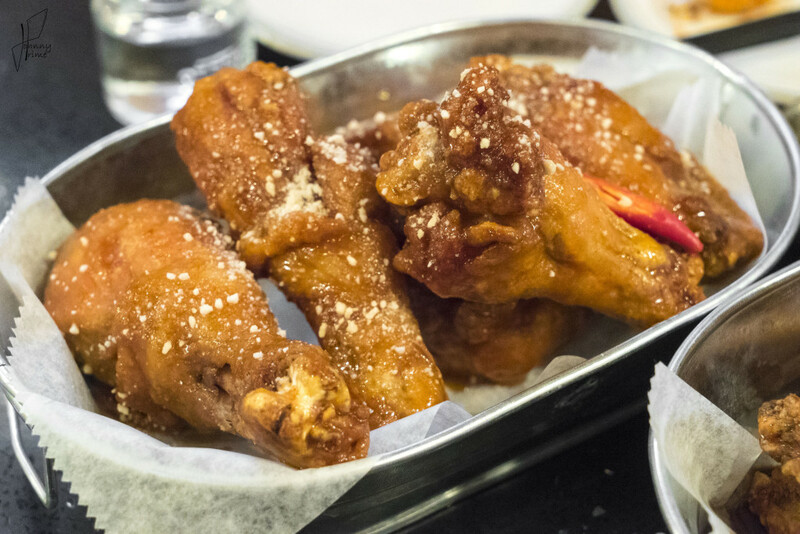 In any case, Hell’s Chicken serves up some tasty Korean style fried chicken! The batter was nice and crispy, and one of the sauces, the soy ginger, was really delicious. Even the drum sticks were adequately battered and sauced, so that the ratio between meat and batter was in the proper proportion. We also tried the “spicy hell” sauce, which is tomato based and gluten free. It did not deliver the kind of heat that one might expect from such eloquent naming. I thought I’d be shitting molten lava afterward, but that won’t be the case (thankfully). In any event, don’t be afraid! A good, welcoming heat creeps up a few seconds after your taste buds get to work, and the end result is pretty addictive. That’s cashew powder sprinkled on top, by the way: a very interesting touch. 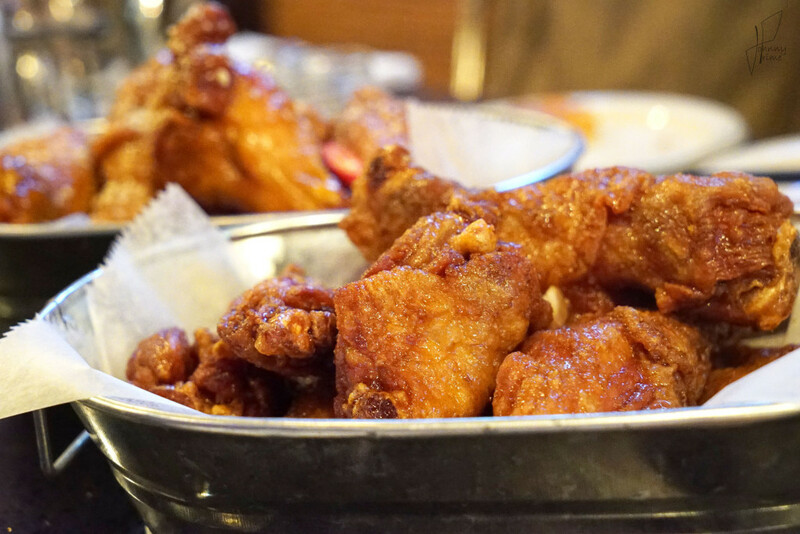 Not only does this place do fried chicken, but they also serve up some traditional Korean dishes as well. We tried three courses. 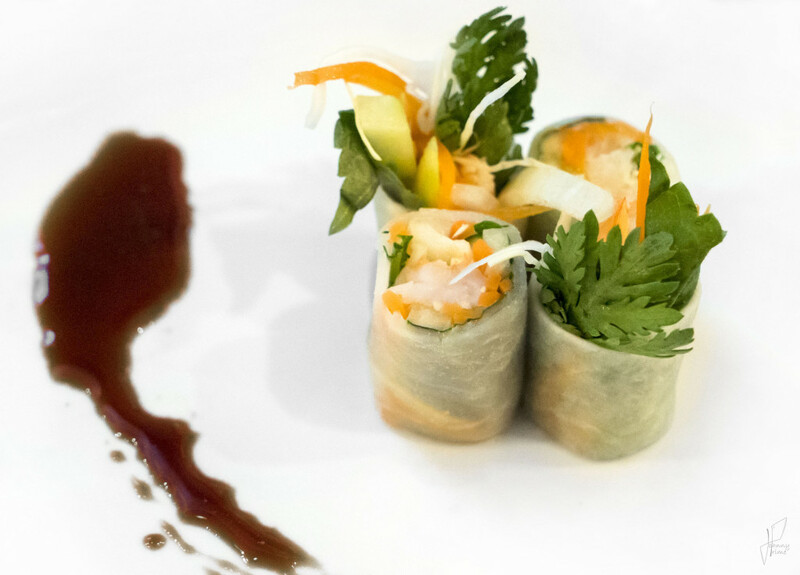 This first bite was a shrimp and veggie roll wrapped in pickled daikon. It was nice and refreshing, with a hit of sweet pickled goodness from the daikon. 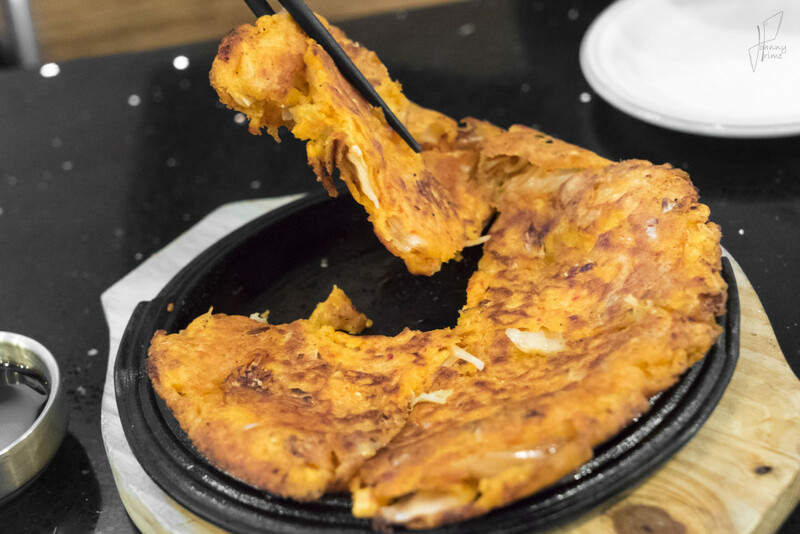 Then we sank our teeth into this kimchi pancake, made with eggs, flour and pickled cabbage. It was crispy but had a nice dense, substantive texture to it from the kimchi inside. This might have been my favorite dish of the night. Next up was this platter of bork belly and lightly dressed greens. 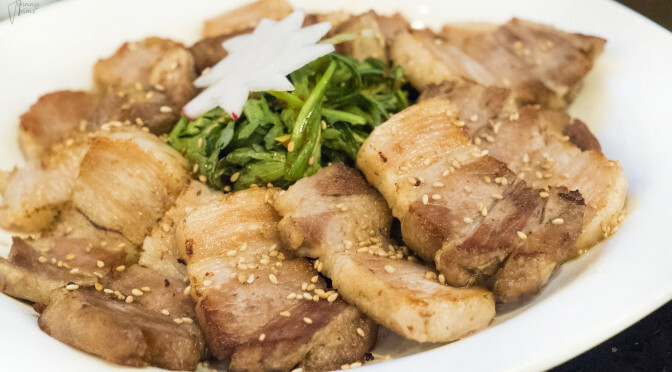 The belly was sliced thick and grilled with simple spices and sesame seeds. 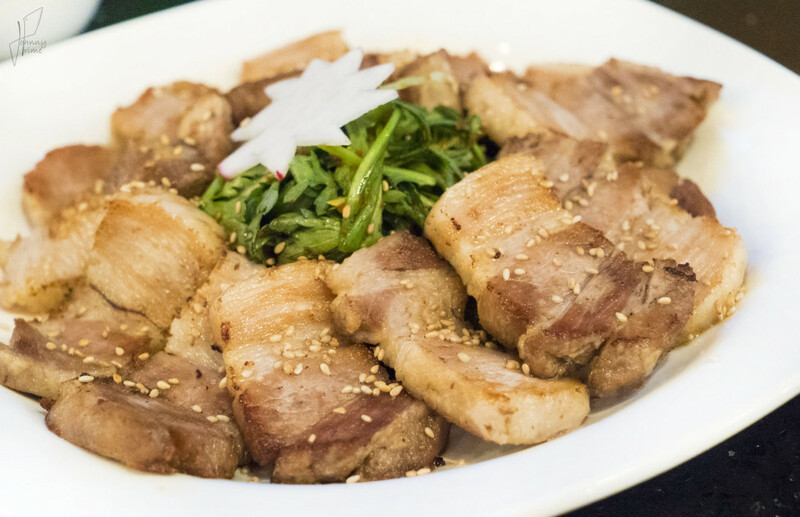 We dipped the pork in spicy bean paste. Awesome. I could eat this every day. 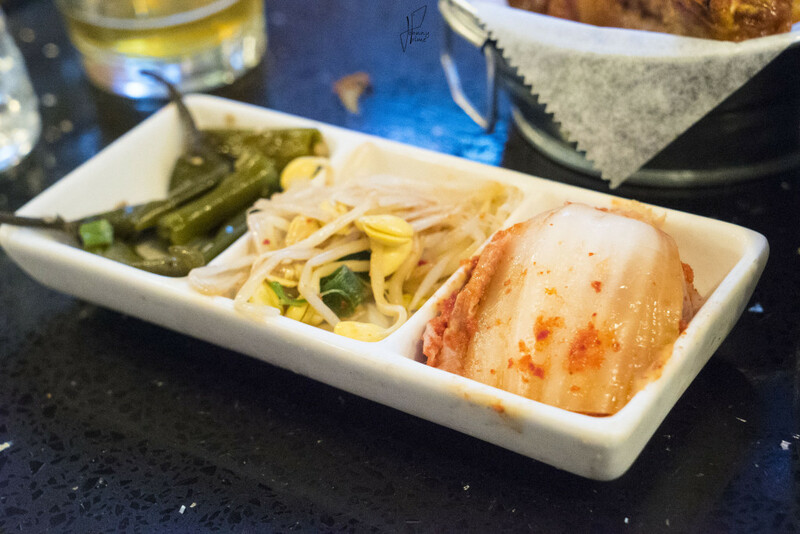 This came out with some spicy pickled kimchi items as well. Shishito peppers, bean sprouts and cabbage. All were pickled in-house. 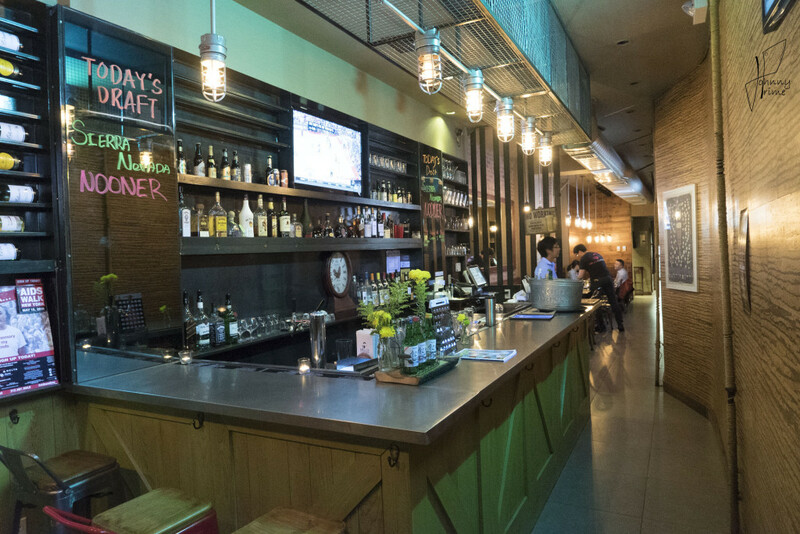 I should also mention that this joint offers a pretty good happy hour deal from 4pm to 7pm, with $5 beers, wine deals and discounted well drinks. 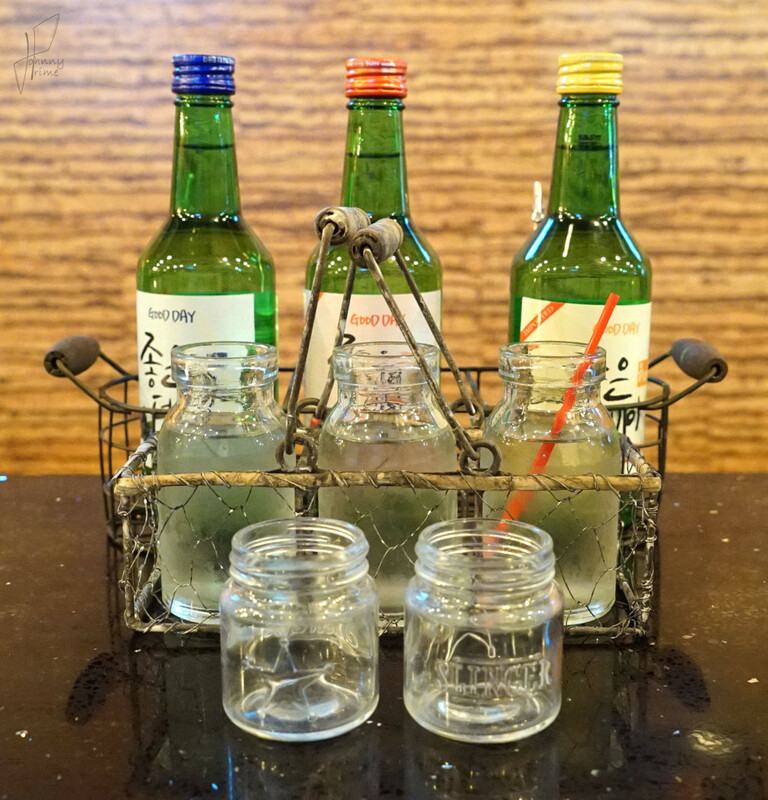 But check out this trio sampler of infused soju: yuzu, pomegranate and blueberry. All were on the sweet side, as opposed to dry. The pomegranate was the best, and most naturally pleasant tasting of the three. I like the old style presentation too, with the small jars. This will run you $18, for what is essentially about 12-15oz of soju. I thought that was a good deal. 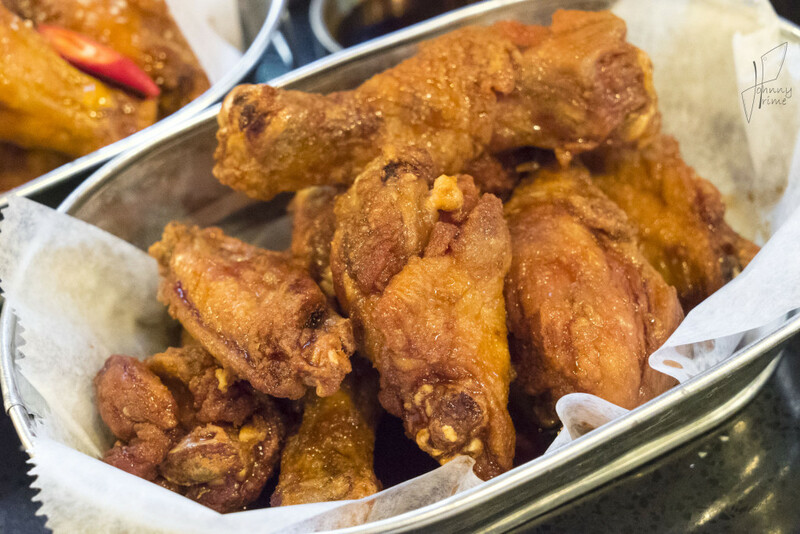 To sum up, this is a great place to satisfy for your Korean fried chicken cravings. The traditional dishes are pretty great too. A guy who sat next to us ordered the bibimbap, and I must say it looked, smelled and even SOUNDED delicious when it came out in the hot clay bowl. That’ll be my next meal here.